As 'ethnic food' (word-dancing foodies: this seems like such out-of-date language but what other word is there?) becomes increasingly accepted, with popularity comes convenience and short-cuts. Lucky-lucky me, within walking distance is an independent grocery called Global Foods, a veritable United Nations of food. The aisles are lined with foods from every part of the world -- well, except Italy, which St Louisans find on The Hill, an old Italian neighborhood with old-style Italian markets, butchers and bakeries -- and familiar tastes of home for immigrants, unfamiliar pecularities for many and a playground for adventurous cooks like me. Tonight I tried a curry starter for vegetables from Asian Home Gourmet, just to see. It was good -- very good! It's a wet paste, not just dried spices. It's labelled "hot hot" -- and indeed it was: even with considerably more vegetables and coconut mik, the heat was more than I'd prefer although would be fine if moderated by good rice. NUTRITION NOTES ... The shrimp is optional of course so this could be a vegetarian supper or a vegetable side dish, either one. ... This is a terrific low-carb, low-calorie, low-fat and low-point Weight Watchers supper. It has lots of flavor, lots of fiber so is satisfying taste-wise and portion-wise. NEXT TIME ... I'll choose a spice packet labeled 'hot' not 'hot hot'. FOR THE RECORD ... This is A Veggie Venture's contribution to the Antioxidant-Rich Tuesdays over at Sweenicks. FROM THE ARCHIVES ... See the Recipe Box for other vegetable-loving supper ideas. Heat the oil in a large, deep skillet over MEDIUM HIGH. Add the spice paste and cook for a minute. Add the onion, pepper, cabbage and mushrooms as they're prepped, stirring well with each addition and occasionally. Add the coconut milk. Bring to a boil. Reduce heat to MEDIUM, cover and let simmer for about 10 minutes. Add the peas and shrimp and let cook through for about 5 minutes. Stir in the cilantro, serve and enjoy! I love a spicy coconut curry - and never tire of it. You're more than lucky. I live in a not so small City in Germany (pop 1/2 Million), but we don't have anything like that either. I quit eating Meat 3 days ago. Alanna, I am moving to St. Louis later this year, and it makes me so happy that it has international foods available! 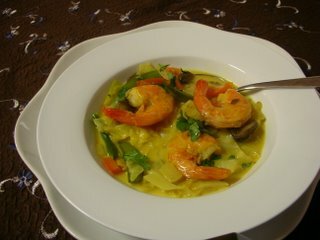 I found your great recipe for vegetable coconut curry after looking for creative ways to finish off half a head of cabbage- I hope you won't mind if I post my variation on my own blog (giving you credit for the original recipe, of course)! Incidentally, I'm a big Harold McGee fan, too. Hi Emily ~ I'm so glad you liked this! Please, do post your variation. BTW since your Blogger profile seems to be blocked and you didn't leave an e-mail address, the only way I can reach you is via this comment so I hope you come back! If it was too hot for you, you can always just use half as much spice paste next time, I am going to try this one you recommended next time I go to the shops.